The orchestra is looking back on quite a busy and hot summer - hot in the sense of the band's repertoire, of course! In July, the cruise line company Holland America engaged the Pasadena Roof Orchestra for their trip from Rotterdam to New York and back. The band performed on several occasions on board - dinner dances, tea dances or even jazz matinées on deck. Despite playing 'Everything Stops for Tea' the engines, thankfully kept going! Every appearance on the ship was well-received. 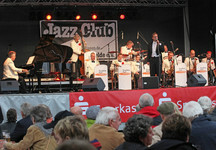 Hardly disembarked and back on solid ground, the band's summer festival season in Germany was under way. As part of Musiklandschaft Westfalen the P.R.O. played in Vreden, at the Jazzfestival Dissen, at the Rheingau Musikfestival in Wiesbaden and their 8th annual appearance at 'Jazz in Town'- the Festival in Berlin-Koepenick, as well as at the Brunnenhof in Munich. For the Munich concert the orchestra invited guest star Helen Schneider for a wonderful summer concert evening.